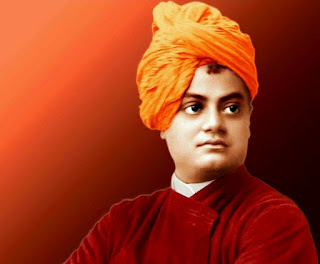 One day in the morning period, in Sarnath, after visiting the goddess Durga Temple, Swami Vivekananda was passing through a place, where there was a large tank of water on one side and a very high wall on the other side. Here, he was surrounded by a troop of large monkeys. They were not willing to allow Swamiji to pass through and there was no other way than that. As he tried to walk past them, they howled and shrieked and clutched at his feet. As they pressed closer, he began to run; but the faster he ran the bolder the monkeys got and they attempted to bite at him. When it seemed impossible for him to escape, he heard an old sannyasi (monk) calling out to him: Face the brutes! The words brought him to his senses. He stopped running and turned majestically to boldly face the irate monkeys. As soon as he did that, they fell back and fled! With reverence and gratitude he bowed and did pranam (salute) to the sannyasi, who smilingly responded with the same, and walked away. Moral : Face your fear to overcome it.